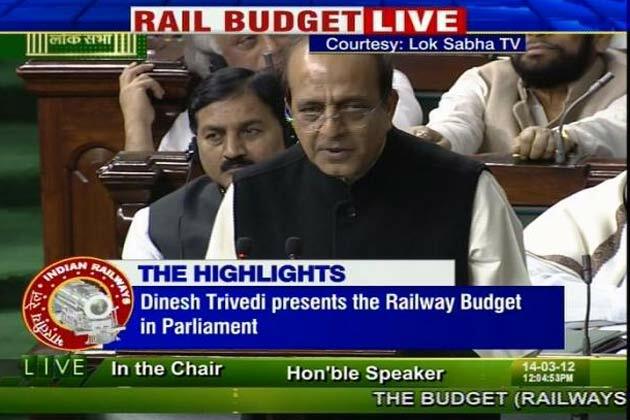 Nishant Chaturvedi...: Rail Budget or De-Rail Budget 2012..
Dinesh Trivedi in his first railway Budget promises to reform railways with an expectation of Rs 2.5 lakh crore as budgetary support from government in 12th five-year plan. Wow Rs 2.5 lakh crore from the government for the 4TH largest rail network in the world and probably the busiest too ! Why cant railways sustain itself with so many resources and with a 24 hour money minting machinery ? This question has been asked for ages, since the time, first rail budget after independence was presented by John Mathai in Nov 1947. The answer to this question lies with us and first we should be questioned.! Ironically we are the ones asking the question ? We as the nation should be held responsible for this mess in railways. Indian Railways probably serves the largest bank of manpower of 7.2 billion people and it is this manpower that can bring in the change ! Q 1. Indian Railways did not increase the passenger fares for last ten years and none of us questioned how will it sustain revenue growth ? We ask for more facilities in train but refused to pay for it. Q 2. Every day 23 million passengers register with Indian railways, but not even 10 % from it ever questions the jugaard approach for reservation confirmation ? Q 3. Like every other year 75 new passenger trains are announced this year, but we never question why increase in passenger trains is not complimented with the increase in railways manpower or infrastructure ? Q 4. Indian Railways has a huge bank of 1.13 lakh acres of land, none of us ever questioned why it has been not used for development of rail infrastructure & industries, hotels & restaurants, shopping malls & recreation facilities ? Q 5. The 7000 railway stations are in a state of mess but we never question our own contribution in their maintenance ? Q 6. Indian Railways is blamed for poor safety standards, nearly 15000 trespassers die every year. But nobody questions the intent of trespassers ? Q 7. More than 2500 passengers and railway staff has died in last 36 months due to train accidents, the main reason being derailment. But no questions are raised on over-reliance of visual signals and complete installation of automatic signal. Rail budget is one more opportunity to remind ourselves that we as a country need to build a national character and own up our collective responsibility for the nation. Only then can come with a real reform, a tide of change that will sweep away the lackadaisical approach of ignoring or suppressing development because individuals look for only self development rather selfless development of the nation. Very well researched article... i think... a lay man would understand railway's miserable condition in a better way. i could at least... and saw some amazing facts... Like i did not know about the area of land railway has in disposal... i loved it... and i muat say your writing always has some freshness everytime... cheers !!!! Eye-opening... time to take the responsibility on the shoulders! "Development Communication" is no longer Media domain but now of every individual! Very true facts....i dont know the day when these politicians will stop taking every thing for granted...when they will think above their cheap politics...when they will understand that the people of this country are no more fools...when they will really think for the betterment of the country...when they will take examples from countries like China and Japan...Dinesh Trivedi took some major steps for the reforms.. but thrown out...and the command of one of the largest railway network of the world is given to someone who is just an 'intermediate' paas out..isn`t they moking our nation..
You proved again to be a sagacious writer,as always.. A thought provoking write up..!! Yes, Its high time WE as responsible citizens must learn to have collective responsibility in Nation Building activities.. Mere Bashing & criticizing won't help our National dream.. A critical analysis can only be good if it followed by actions n reforms.For directing our ideas into action we need lots of research & unbiased information. As I always say Media n Films can play an excellent role in building up National character & National moods..News which is more informative & analytical and not just superfast count of Haphzard Headlines,can help masses understand the ground reality. Hope you don't get me wrong.. this suggestion should be conveyed to people who at the realm of news processing. Every Hindustani is overwhelmed & worried about Govt policies. All are agitated..
Iron is RED HOT. Its time to strike well.. Its time to spread awareness amongst masses.. All must know Sequential events of INDIAN Polity & developmental schemes.All must know-what the policy makers are doing, what is the scenerio & what could be probable reforms. This awakening is required through the mechanism of media.See a breaking news saying MAMTA wants rail minister to quit.. or is she landing in Delhi is not that important..The News should have content that may reflect what policy actually the minister proposed.. Is it really a requisite? or not.On what grounds others are agreeing or disagreeing to the view point..
Let public grow in wisdom,Lets learn n develop an ability to decide our own fate..
Good if we look forward for a collective reform.. But to have such a Socio-political awakening we must rejuvenate Positivity in Public sentiments.We need to reestablish faith in commonmen that his little deeds will be aknowledged.. His positive effort will have an impact.He can help paint a beautiful picture of tomorrow. While introspection we Always crave for "reinforcement of faith in GOODNESS". LETS change the taste of "Social Appreciations"..
For that, I know sir, you can always be a great flag bearer..All the best keep churning up our grey cells, Regards. Very Lively & Patriotic discussion. 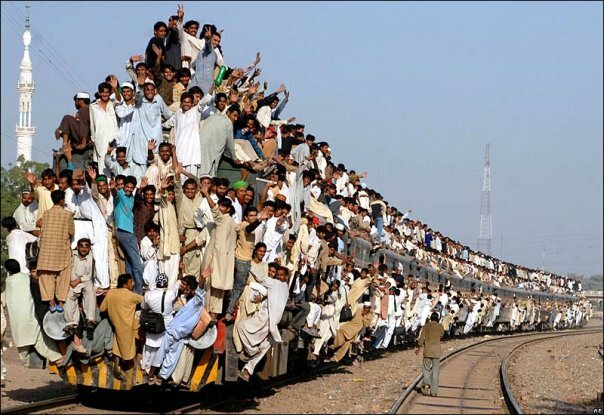 We Pakistanis, look at Indian Railways full of awe. Pakistan Railway is a MESS. But the photo you show in this article, is a Pakistani Train.